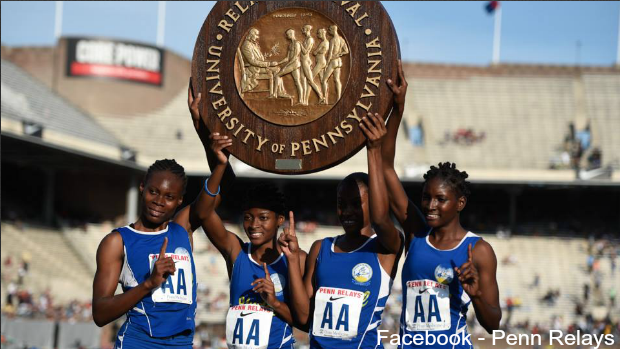 Hydel Girls of Jamaica Bringing 3:33 4x400 to VA Showcase! LYCNHBURG, Va. - Meet management is excited to announce that Hydel, the Penn Relays record holders who blasted a 3:33.99 for the 4x400 win in 2017, is headed to the 2018 VA Showcase. This Hydel squad made history last April and will be looking for some very fast times this January. Hydel's toughest competition will certainly come from the double threat of the Bullis School (3:39 indoors) and St. Jago (3:36). All three teams are certainly within striking distance of the US National and World Junior record of 3:38.91 set back in 2004 by Long Beach Poly. It took a 52.4 and 53.2 split on the third and fourth legs to get that record. Splits of course will be the name of the game when it comes to this race January 19th (LIVE on FloTrack). Last April this Hydel squad split some very fast times. So fast in fact, that they took up three of the four fastest splits of the relays. The only one breaking into their lead was Sydney McLaughlin with her 50.37. Indoors this could be a different story. Though Hydel brings to the table a 52.7, 53.31, and two open 55's they will still have to run as fast as they can with St. Jago and Bullis looking for the win as well. St. Jago's top runner entering went 54.29 in the open last year meaning we could see multiple 52 splits from the Jamaican powerhouses. The US National Champions, Bullis School, are no slouches either. Their firepower comes from their depth and they certainly have a lot of it. That depth and talent, not even at 100%, brought them to a 3:39 solo effort last indoor season for the win at NBIN. They return everyone and then some this year meaning you could very well expect a low 3:34 by outdoor season. With Hydel likely front-loading it again, this race should come down to the anchors. Though both St. Jago and Hydel may have 52 splits, Bullis may have the ace of the race with Shaniya Hall in their lineup. She split 52.7 last year as well at Outdoor Nationals to bring her team back for the win as a freshman! She is only beginning to realize her potential and already ran 6.98 this indoor season.